Description: Two diametrical oblique tubes of Steel are featured in a Silicon Bronze finish and strike an intriguing pose that boasts a bold, industrial look. 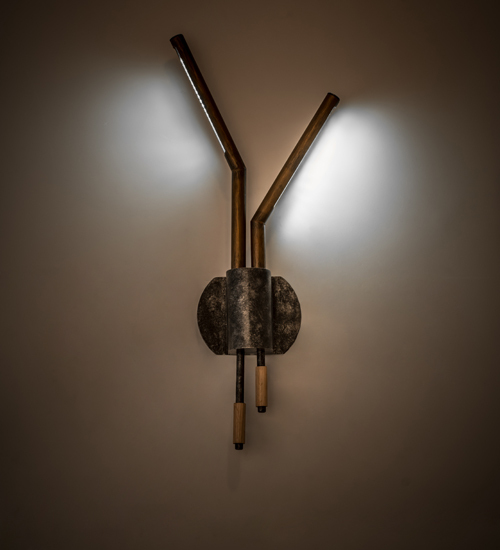 The elbow-formed rods are accentuated with Tawnyrock Idalight cylinders and embraced by a wall mount featured in a stunning Black Nickel finish. Integral 4-watt LEDs deliver outstanding light, energy savings, reduced maintenance and long lamp life. Handcrafted in the USA, this fixture is offered with custom designs, styles and sizes, as well as dimmable lamping options. This fixture is UL and cUL listed for damp and dry locations.